Are long-term contracts anathema to customer loyalty? Last January T-Mobile announced that it would do away with the two year contracts on its phones. The last weekend the new pricing plans showed up on their website. To lure customers away from others, T-Mobile is offering unlimited voice and data for between $50-70/month. What is notable, though, is that now they are doing away with the two-year contract that everyone loves to hate, along with the very steep early termination fees that everyone loves to hate even more. The question? Are long-term contracts anathema to customer loyalty? According to the American Consumer Satisfaction Index for May, 2012, mobile carriers such as AT&T Mobility, Verizon, Sprint and others have scores in the 69-70 range, whereas the no-contract carriers such as TracFone have a score of 76. By way of reference, Apple’s score for their iPhone is 83. 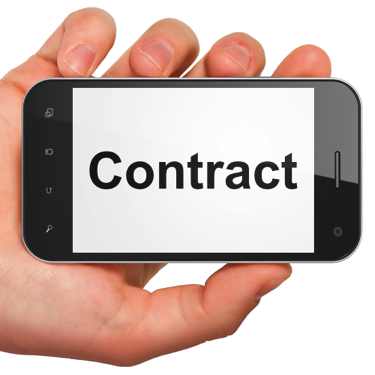 Cell phone carriers tease you with a discount on the phone and then lock you into a two-year contract in exchange. The penalties for early termination are ~$200. Rather than subsidizing a $650 iPhone and charging higher fees for the duration of the subscriber’s tenure, T-Mobile is breaking ranks with the industry and allowing you to either pay up front the full cost of the phone, or pay an additional fee above the data plan for two years until the phone is paid off at which time the monthly fee reverts to the lower amount for service. In essence, you pay the exact same if you pay up front or over time. The biggest difference is in captivity and penalty. Loyalty is an attitude of allegiance, and is most accurately measured by a history of repurchase, especially in the face of competition. When you have no competition, enforced long-term contracts, or even legislative mandate, you don’t have loyalty, you have captivity. Dissatisfied captive customers will often exit given the first opportunity, such as a new competitive offering, expired contract, or legislative revolt led by other captive customers. Software as a service (SaaS) companies are providing strong and favorable alternatives to long-term software and service agreements. Lawsuits have been successfully settled against VISA and MasterCard for their anti-competitive clauses in their merchant agreements. Can you have loyalty AND service contracts? Or do the service contracts simply mask bad behavior that wouldn’t be tolerated by customers in the absence of the lock-in? Or would your company be better off in the long run by foregoing the easy up-front money of the service contract and investing in creating an enjoyable customer experience that eclipses competitors?